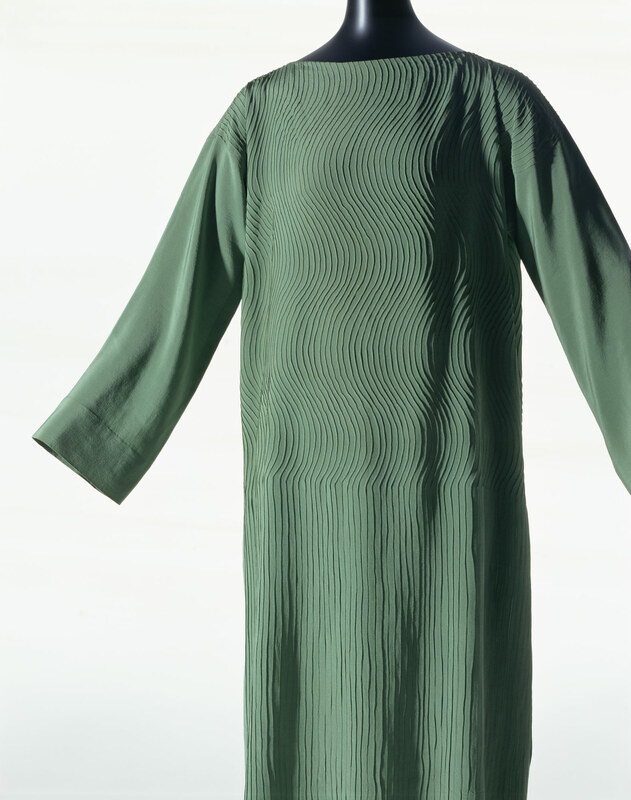 Green silk crepe; straight silhouette; boat neck; all-over wavy pattern in pin-tucks. Pin-tucks were hand-stitched all over the dress. At first glance it looks simple, but it was realized by exquisite handwork only found in Haute Couture, which is impossible to realize today. In this dress pin-tucks are used both for decoration and for a functional purpose. We can glimpse here the essence of dress making by Madeleine Vionnet, who said "Being simple encompasses all complex factors." From an early stage, Vionnet aimed to liberate bodies, and inspired by the straight form of Japanese kimonos, started to create dresses focusing on kimonos' structures in the late 1910s. Eventually she established a new structural concept for clothing that reinterpreted and highlighted the beauty of the female body. This day dress is one of Vionnet's landmark works, marking the peak of her achievements in the 1920s.